A couple of weeks ago Kari started stuttering. It came out of the blue, no warnings, and over a day or two the stutter was so severe that she gave up completing her sentences. “I can’t say it!” she would sigh, dramatically. (Always the diva) Freaked out? Why, yes, yes I most definitely was! I had read up about stuttering in toddlers a few years prior because Hubstopher also has a stutter and I wondered if it was genetic. I mean, I was prepared for it, but I wasn’t, if that makes sense. 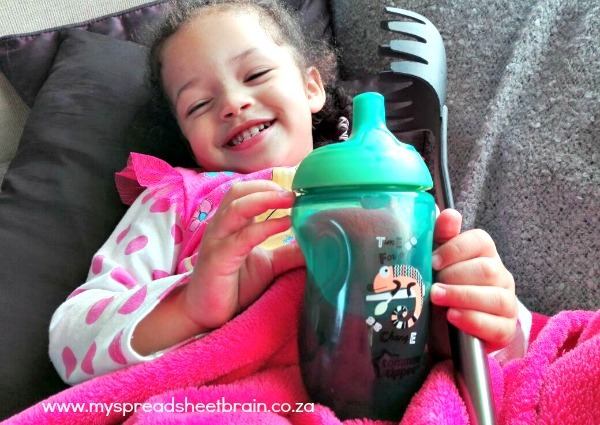 To see my 3-year old show symptoms of the speech impediment shook me! We immediately brushed away the idea that this was learned behavior. I mean, Hubstopher’s stutter has simmered down to a slight stammer and he sometimes has whole conversations with out you even noticing his speech impediment. So it wasn’t likely that she was mimicking her daddy. And anways, his stammer was more syllable focused. Hers was pretty intense… she was stuttering whole words (not just syllables). What on earth could this be?! Anyways, I did what any rational, modern mom would do. I asked Google. Look, I was prepared to take the kid to a speech therapist like, yesterday! Judging from the stories Hubstopher has shared about his struggle growing up with a stutter, it wasn’t something I was looking forward to seeing my daughter try to work through. Guys, what I found on Google surprised me! For starters, Google literally told me to take a darn chill pill woman. Okay, maybe not literally, but that’s what I read between the lines. Apparently stuttering is not uncommon in kids between the ages of two and five. Language dysfluency is basically a coping mechanism that occurs when little ones are learning to form words into sentences. The dysfluency usually manifests in word or phrase repetitions and, surprisingly, 5% of all children are likely to be disfluent at some time in their development. When kids feel rushed to speak, or they have a lot to say (but their brain is still catching up with what their mouths want to do), the stutter can occur. It’s also more evident when the child is excited, tired or stressed. The disfluency can come and go but it usually only sticks around for a short period of time. Experts say that if the stutter lasts for more than six months, you should then consider taking your kideo to a therapist. But wait it out. Educate yourself. Know what to look for and how to respond to the stutter. There is some debate with regards to whether genetics play a role in stuttering. But we are confident that this is not our girl’s portion. In fact, the stuttering has since subsided and has been reduced to a stammer. Kyle has been a super sweet big brother, telling her to take a breath when she’s struggling to get a word out. It seems to be helping. We also try not to finish her sentences for her and of corse, we don’t show impatience towards her. We will be monitoring her for a few months to see if it worsens. But until then, it’s business as usual. Which means I get to listen to her endless Barbie bedtime stories. Yes, she tells ME a bedtime story. Has your child ever showed signs of disfluency? Share your tips and advice in the comments section. My two older kids stuttered for a bit. I was a bit worried because, the same as you, my husband also stuttered as a child (and sometimes still). As they grew older, they stopped stuttering. I don’t think you have anything to worry about. I totally agree with what Dr Google has said “take a chill pill”. I also do believe that a child who is exposed on the daily to a parent with a stutter will more often than not have learnt behaviour. Karis is also a bit too young to be worrying about this been anything permanent. Good on Kyle for telling her to “breathe”! That definitely works and helps! Christian also went through the same thing last year; Lyle stutters; they were ready to take him to a Speechy but fortunately they decided to “sit it out” by giving him some helpful tips like “breathe, slow down”! Its a learning stage! All the best!